At Keyes Honda, we have long awaited the unveiling of the new 2017 Honda Civic Si. Our wait finally ended when Honda showcased the Honda Civic Si prototype at the Los Angeles Auto Show last week. Promised as the “fastest, most powerful Si yet”, the 2017 Honda Civic Si is packed with numerous advanced performance features. 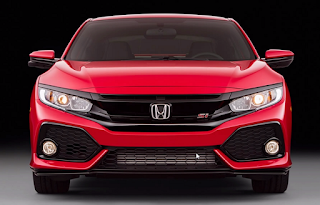 Offered in coupe and sedan body styles, the Honda Civic Si will be equipped with a 1.5-liter turbocharged, direct-injected dual variable cam timing engine. The engine will be backed exclusively by a short-shifting six-speed manual transmission. The concept previewed at the Los Angeles Auto Show features a full Honda Factory Performance (HFP) aero kit complete with front and rear splitters and a rear spoiler. It also sported a center-mounted dual exhaust with polygonal tips and turbine-like 19-inch HFP forged alloy wheels wrapped in 235/35-size performance tires. The interior featured sports seats with red stitching and embroidered Honda Civic Si logos. Red stitching is also used on the door, panels, steering wheel and shift boot, which is topped by an aluminum shift knob. The gauge cluster features a red TFT display, and the lighting for the audio system is also red. Finishing off the cabin are aluminum sport pedals and Dry Metal Carbon trim around the instrument panel and across the dash. Honda announced that the 2017 Honda Civic Si is very close to production, so we hope that all of the features in the prototype will be available in the final production models. While we now not so patiently wait for the Honda Civic Si to hit our showroom, we’ll be checking out the current Honda car models in our extensive inventory, including the 2017 Honda Civic. If you are interested in learning more about the Honda Civic Si or are interested in purchasing a Honda vehicle, please stop by our Van Nuys, CA area dealership. We hope to see you soon!